I often find myself on a lake during the early evening, after the wind has settled down and the lake’s surface is calm and smooth as glass. Paddling my kayak across that mirrored surface with the reflection of the sky below me is blissfully serene and relaxing. Just below me is an entire community of organisms adapted to living in, on and around the surface. For them, the surface of the lake is anything but calm and serene. It is a frenzy of activity, but on a tiny scale. Their razor-thin world, called the “surface microlayer,” is bombarded by solar radiation and patrolled by ravenous predators. Water molecules form stronger bonds with each other at the air/water interface than they do under the surface, a phenomenon we all know as surface tension. Organic matter tends to accumulate here, either falling from above or rising from below, becoming trapped in the surface layer. Not surprisingly, sunlight is most intense at the surface of the lake. Solar radiation breaks apart the particles of organic material which in turn reduce the surface tension of the water. With some surface agitation (wind, waves, bubbles, etc. ), lake foam will form on the surface (if you see foam on a lake, it’s probably not soap). As the organic material increases, the surface microlayer thickens from around 0.1 µm to 400 µm. By comparison, a human hair is approximately 25 µm thick and a sheet of copy paper is roughly 100 µm thick. Once associated with a thick matrix of organic material, the surface microlayer would seem like an immense forest of food at the microbial scale. The few bacteria that survive the constant bombardment of solar radiation have the potential to do very well in this environment, “eating” and reproducing, turning the abundant organic material into more bacteria. With plenty of food available, bacteria will accumulate within the matrix of the surface microlayer, sometimes colonizing to form a thicker bacterial layer. The carbon energy of the microlayer’s organic particles is moved into bacterial cells, making it available to other, larger organisms. Thus the base of a special microbial food web is formed. Protists, like amoeba and paramecia, dart through the matrix, grazing on the bacteria that cling to every surface. For a sense of scale, if you were the size of a paramecium, the bacteria would be approximately the size of raisins or peanuts. To some of the smaller protists, the bacteria might be closer to the size of apples or grapefruit. Many species of protists can photosynthesize, making their own food when they have to, but will graze on bacteria if the opportunity arises. The Lakes of Missouri Volunteer Program estimates the biomass of algae, which are protists capable of photosynthesis, when measuring chlorophyll concentration of lakes. 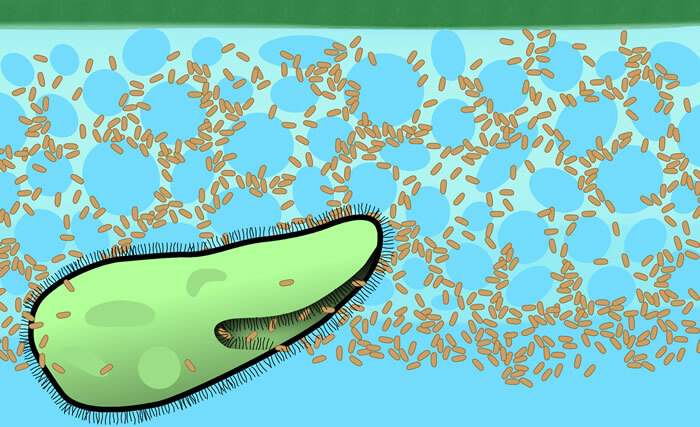 Many protists become food for larger, multi-celled organisms, like daphnia and copepods, that are eventually fed on by still larger animals that are visible-to-the-naked-eye. Neuston: a topminnow, water strider and mosquito larvae. The organisms associated with the surface microlayer are collectively called the “neuston.” Because scientists like to categorize things, the neuston are often divided into groups, depending on where they reside in relation to the surface layer. Organisms living on the surface layer are part of the “epineuston,” and those living on the underside of the surface layer are part of the “hyponeuston.” Because scientists really like to categorize things, the neuston can also be grouped according to how much time is spent at the surface. Some critters will live their entire lives in the surface layer (euneuston). Some will come to the surface only at certain times of day, or during certain stages of life (facultative neuston). Others normally live in deeper water but some individuals come to the surface (pseudoneuston). The next time you are paddling around a lake or pond, take a closer look at the surface of the water, especially near the shoreline. 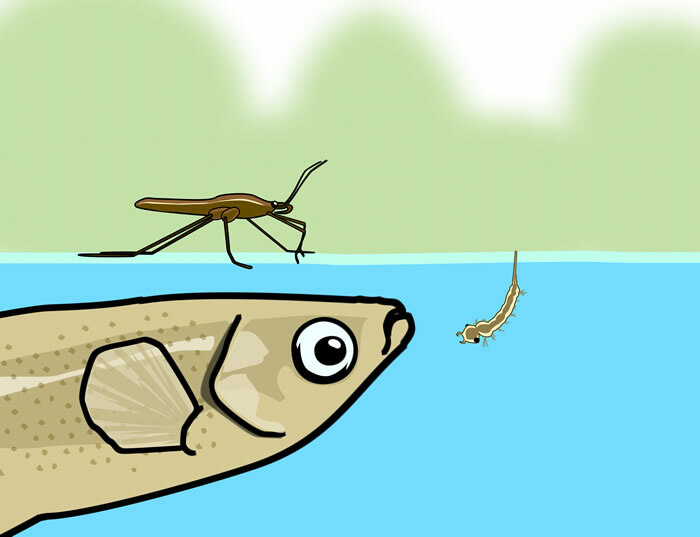 You may see mosquito larvae hanging from the surface, whirligig beetles cruising the underside of the surface, water striders walking atop the surface and topminnows eating any of the above. All of this is made possible by things you can’t see, the strong molecular bonds of water at the surface, the organic matter that collected there and the bacterial community that resulted.